Okay, this is not going to be immediately apparent upon reading this strip, but believe it or not that last panel is fairly significant. For a few years in a row we posted teaser posters that hinted at upcoming storylines. The last one we did was in April of 2012. I really, really, honestly thought that moment would hit around December of that year. If you clicked on the link then you know that I was way, waaaaay off. Today’s strip marks the moment that poster was teasing. Today. Basically, I found a lot of roads I wanted to travel before getting to this moment and certain things–like the Jerry-Spy Gal confrontation–ended up being much bigger than I thought they would be and taking long enough that I’m sure most of you forgot the 2012 teaser even existed. Oops. Anyway, here we finally are. Not on schedule, but more or less where I thought we would be when Spy Gal finally found out the full extent of Jerry’s madness. You’re welcome. Or not. I’m confused. Of course, the fun part now is that you have NO IDEA what’s coming next. Not that you usually do, but you don’t even have a hint now. Huh. It may be time to do another teaser. Okay, the coolness below is brought to by one Mr. Marc Lapierre and some handy dandy Photoshop filters. 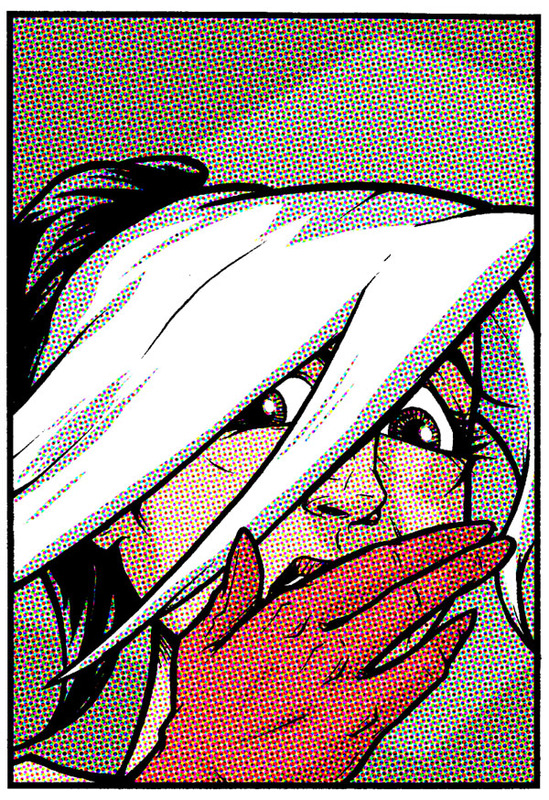 After drawing that last panel of Spy Gal, Marc was reminded of work of Roy Lichtenstein, noted crook and thief. Blown up real big like this, it’s hard to argue with him. It is coolness, Marc. It is coolness. He’s is a lot more open about it than I wold have expected. And he seems Spy Gal to just be cool with that. A teaser is always going to have a bit of mystery to it. “What does it really mean?” and all that. In this case the teaser was intended to be symbolic of a moment, not a literal depiction of it. We appreciate the feedback. We’ll see what we come up with for the next one. Yep, Jerry is now a gonger for betraying the human race like this all for the stake of a girl. Jerry truly has no shame for his actions at all, doesn’t he ? Your now a villain Jerry. You should know better not to trust a villain’s word. Especially if they hate you and have no reason to keep their word after you give them what they want. You did it with so many other people why didn’t you expect them to betray you? “Jerry’s problem is that he never grew up. He’s still that child, wanting the attention, desperately wanting the things he wants. And he’s willing to manipulate and destroy others’ lives, even those that he supposedly loves, to get what he wants. He did it with the Captain back in the 1970s, turning against him rather than helping, and he did it again in Vegas, preying on the Captain’s weakness to pull Spy Girl away and to him. Now, he’s willing to let everybody else burn to keep SpyGirl. Including the innocent. That’s right! I remember that comment! You were exactly right then. Nice work! So he’s really testing whether she would or wouldn’t love him if he were the last man alive. No idea what’s coming next, Brock? Pshaw, we both know I have an endless supply of ideas of what will happen next. They’re just usually wrong. Am I the only one who keeps thinking that it just took one hit for Money Man, so if everyone left Soviet Sam alone to guard Jerry for a moment . . . Also great job on everyone’s expressions in panel three, Marc. I’m not sure that he could do it. Sam’s a truly decent person. In fact, he’s very similar to the Captain in a LOT of ways in my opinion from what we’ve seen of him. Given the chance, I don’t think that he do it, especially considering how his accidental murder of Money Man tore him up. I think just about anyone is capable of just about anything if choose to be. We get pushed sometimes, and sometimes we surprise even ourselves. I agree with Jordan that it doesn’t really seem like something Sam would do… but would he given the right circumstance? It would be out of character, it was mostly just wishful thinking on my part. If you really wanted to throw in a shocking plot twist, I’d have Atomic Fly do it. Jerry’s gone through a wide array of emotions in the past strips, hasn’t he? First, there was denial he’s a villain and anger at being accused, barganing with Spy Girl that their marriage will last (“I’ll sleep on the couch”, “go see a councilor”), finally we see some acceptance in the last panel “Of course I’m working with them.”. He even apologizes to the other guys for their imminent death at his hands (sort of). So, now that he’s gone through his stages of loss and grief, I’d say loss of ever being acknowledged as a superhero, my money says he’s going to accept being a villain and break out of Valhalla. You’ve pretty much nailed it. Jerry has gone through a seismic shift in his life. A little while back, he lost the knowledge of where his life was going when his own personal timeline caught up with the knowledge imparted to him by his future self. Even given that, there was no reason for him to think that things weren’t going to work out since everything had been going according to plan. But now…? He’s in unknown territory and that represents a loss for him. A massive loss. It seems that we’re having Tangerine and Jerry in a kind of parallel situation at the moment. Both were forced to choose between their principles and the ones they love. In both cases, they chose the people they love over all else. So how are they different? Jerry is completely unashamed of his actions. On the other hand Tangerine has been reflecting on his life and actions and not liking what he’s been seeing. Thus it seems to me that Tangerine is slowly redeeming himself and will continue to try to do so, similarly to Sam. Jerry on the other hand is completely unrepentant and may even embrace becoming a villain openly soon enough. Great thoughts, Jordan. And you pretty much nailed why I felt it was important for Tangerine’s story to reach this crescendo at the same time as Jerry’s. I’m thinking that a certain other person whom we have assumed to have no powers is going to play a fairly sizable part soon. Gina took pains to bring him back to the future, and her mage buddy seemed a bit taken aback. I have a small hunch that a set of restraints won’t be of much use when he decides to act. Could he be the ominous other that Four-Fingered Money Man warned Cap about? He seemed way too cheerful for someone help captive by maniacal aliens bent on world destruction. The only ones I’ve ever seen be that cheerful were people who were only humoring their captors, who could cease being captive whenever they chose…and I don’t think it was just because the 60′s were good to him on the way forward in time, if you get the gist of my drift. But then, I no longer make predictions for this comic, you know. Ah, obsession, the most complex of linear weave. It consumes all threads and buries the needle. Nothing in thy sight shall e’er leave. that took in thy everything hither and tither. What vacuum that now consumes thee at what was to be zenith’s inception!